Becoming a high school history teacher means that you will be teaching students about history in many different time periods. While you may cover colonial history in the United States for one course, you may be asked to do an ancient history course for another group of students. Many aspiring history teachers are even surprised to find out that history teachers cover modern history as well, engaging students in discussion about current events, politics and the social sciences. These are the steps you need to follow in order to teach history in a high school classroom. As high school history teachers are expected in be experts in many different historical periods, it is often recommended that future classroom instructors earn a bachelor’s degree in history. This degree program will provide you with a foundation for teaching history to high school students, and allow you to specialize in an area that you are most interested in learning about. The average bachelor’s degree in history takes about four years to complete, and you can earn this degree at a physical university campus or through an online learning university. Online learning institutions allow students to complete coursework whenever and wherever they are most comfortable, and is a convenient way to earn a bachelor’s degree. After graduating with your bachelor’s degree in history, you will want to enroll in a teacher certification program. This specialty program allows someone who has already earned a bachelor’s degree to receive the training they need in order to become a teacher. Coursework often covers topics such as curriculum development, classroom instruction and educational technology. As a high school history teacher, you need to not only understand history but also know how to develop classroom lesson plans that make history relevant and interesting to young adult students. 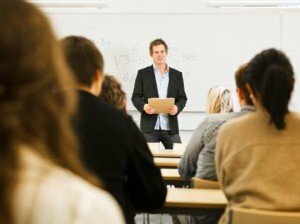 Many people are able to complete teacher certification programs online through accredited online learning institutions, allowing you to easily complete this important step to becoming a high school history teacher. Schools want to hire high school history teachers who have direct experience working in a classroom. One of the only ways to get this experience is to complete a student teaching program. These programs are typically required in a bachelor degree program that is geared toward education, and they also are a requirement of most teacher certification programs. Student teaching will allow you to spend time in a history classroom with an experienced teacher. You will get the opportunity to work directly with students, develop history lesson plans and monitor the students’ progress throughout the school year. After you have completed your education and internship, you will need to pass a certification exam and earn a license in the state you are going to teach. Every state requires teachers to earn a license to teach, but the requirements vary based on the state that you will be working in. The average high school teacher must take a certification exam that tests them on basic classroom skills, but most history teachers also will have to take a specific history certification exam. In addition to having a working knowledge of history across many different periods and countries, high school history teachers should be creative and able to inspire students to think critically about history. A high school history teacher should make history fun, inviting and interesting, allowing students to take an active interest in the past and apply history lessons in the future. According to the Bureau of Labor Statistics, the average high school teacher earns an annual salary of $53,000 and job growth is expected to be about 7 percent during the next decade. To find out more information about becoming a high school history teacher, fill out our form today.